South Gallia’s Ean Combs (24) carries the ball during the Rebels 42-20 victory over Wahama in a Tri Valley Conference Hocking Division contest on Friday night in Mason, W.Va.
MASON, W.Va. — From party crashed to party crashers. The South Gallia football team were locked in a tightly contested game through one quarter of, as host Wahama trailed by just two points, but the Rebels took advantage of five turnovers by the White Falcons the rest of the way en route to a 42-20 decision in a Week 8 Tri-Valley Conference Hocking Division contest on Friday night in Mason County. Following a 13-play, 70 yard opening drive, SGHS (2-6, 2-5 TVC Hocking) soared to an 8-0 advantage , as Tristan Saber connected with Kyle Northup on a 12 yard pass at the 5:03 mark of the first period. The White Falcons (1-7, 1-6) answered a mere 59 seconds later, Brayden Davenport scampered for a four-yard touchdown run to cut the deficit to 8-6. The Red and Gold accounted for all of the scoring in the second quarter, as Jeffery Sheets 12 yard rushing touchdown with 6:37 remaining until the intermission widen the margin to 14-6. SGHS tacked on its third touchdown of the game, when Jared Ward hauled in a 76 yard pass from Northup to cap off a four-play, 92-yard drive at the 2:23 mark of the second period. Garret Saunders added a successful two-point conversion run, as the Rebels extended their lead to 22-6. Following the break, South Gallia widen the margin to 28-6, as Ward grabbed a 10-yard touchdown pass from Saber at the 9:17 mark of the third quarter. Wahama, however, closed the gap to 28-12 when Abrahm Pauley connected with Brady Bumgarner on a 57-yard touchdown pass with 8:15 remaining in the third period. The Rebels outscored the hosts 14-8 in the finale, as Sheets scored his second rushing touchdown of the night with 8:41 remaining in the contest, while Saunders punched in a two-yard run 3:36 later to extend the visitor’s lead to 42-12. Wahama narrowed the margin to 42-20 with 1:09 remaining, when Pauley scored on a 12-yard run and Davenport followed with a successful two-point conversion run. 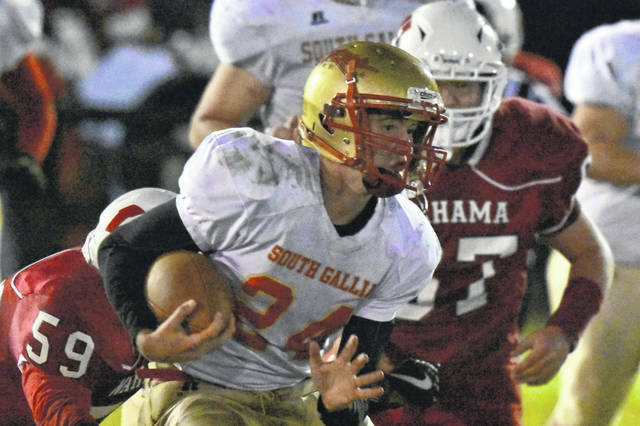 South Gallia claimed a 18-5 edge in first downs, as the Rebels were penalized eight times for 52 yards. WHS was conversely flagged three times for 20 yards. The visitors claimed a 5-1 edge in turnovers, as Wahama tossed two picks and lost three fumbles in the contest. There was a total of 674 yards of total offense in the game, as the Red and Gold claimed a 349-44 advantage in rushing yards, while the White Falcons had a 143-138 edge through the air. Northup paced the SGHS rushing attack with 137 yards on 20 carries, followed by Sheets with seven carries for 64 yards. Tristan Saber finished with a 5-of-9 passing performance, including one touchdown, for 62 yards. Four different Rebels players caught at least one pass, as Ward led the way with two catch for 86 yards. Following the game, SGHS first-year head coach Mike Smith was pleased with his teams performance — particularly that of his younger players. Pauley led the way for Wahama with a 4-of-15 passing performance, including one touchdown and two interceptions, while also providing 18 yards on seven carries. Three different White Falcons players hauled in a catch, as Bumgarner led the way with two grabs for 71 yards. First-year WHS head coach James Toth was candid in his response regarding his team’s performance. Up next for the Rebels, a home date with Miller on Friday at 7:30 p.m. The White Falcons have a bye next week and return to action for a road date with Trimble on Oct. 26.